Panoply: Let's Go on a Pick! Let's Go on a Pick! The first is a really cool deal I scored at an estate sale recently. 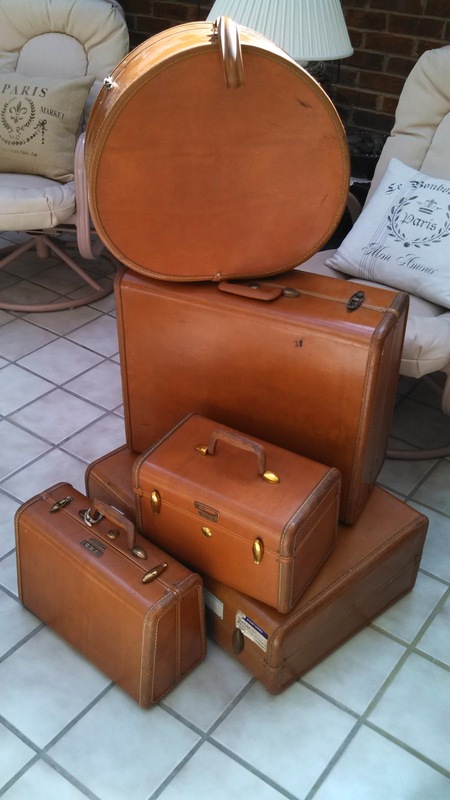 It's not very often that you can find an ENTIRE set of vintage luggage, let alone one with the hatbox piece! I was sooo excited to score this set. I definitely need to foster these for awhile. The hatbox piece came with its original shipping box from Schwayder Brothers, Inc. in Lincolnwood, Chicago, and was dated 12-14-55. Declared value at the time: $50. That's equivalent to just under $500 in present value. These next few items look like I'm taking up farming, lol. 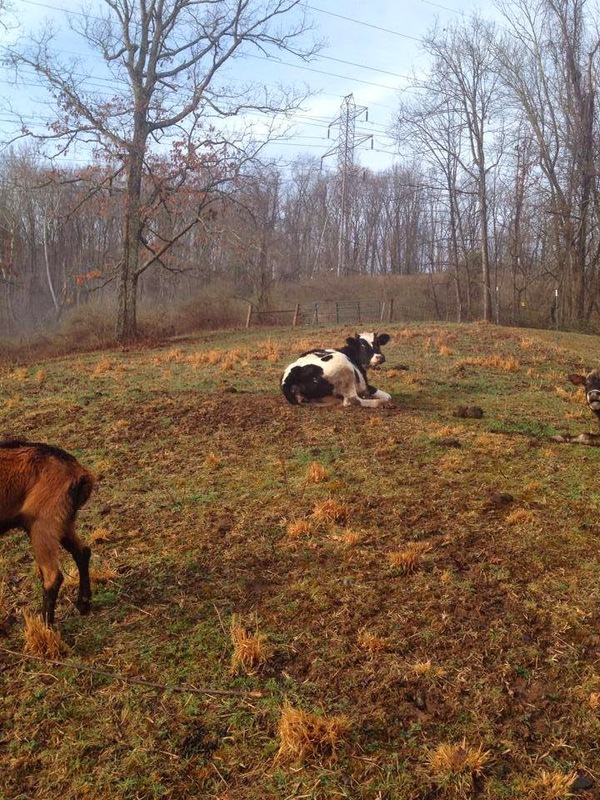 The cow and hen came from the same estate, a sale hosted by a friend. Another of the host's friends was in attendance, and she said, "oh, that looks like ClaraBelle!" That gal's a farmer, for real, so I got on her Facebook page to grab a photo of ClaraBelle, just to show you the strong resemblance! Why didn't she buy her ClaraBelle?! My cow has officially been dubbed ClaraBelle. The pig board, petite-sized, was a boy's shop class project. I love it, and may add a curly twine tail. Lo and behold, I got it home only to discover I have another tureen in the exact pattern (grape), so this one's already been placed in the house, at least for now. In the photo below, the new one is on the far right, in back, and the smaller one in front of it is the one I already had. Okay, the next item's one I bought and actually placed in the store, lol. Of course, there's hardly a sale Panoply goes to without coming away with a few (or a LOT) of linens. These linens are not too old, probably 1960s, maybe even 1970s, but they're cute (the napkins are Vera) and will likely sell during warm-weather months, and they were all bought at 50% off. The next two runners I bought with my own household use in mind. They're newer, from Macy's Charter Club line, and were dirt cheap at the 50% off day. One is long enough to use either on my DR table or...my king-size bed! You know how they put those runners on the end of hotel beds? I kind of like that idea, since we use all white linens in our Master. Just for fun, I played around and snapped this photo to see how it would look. I think I could live with this; now, if only Mr. P. could. We'll see. Are you tired of shopping? Maybe you need a little caffeine so you can re-group and re-energize...we still have some more shopping to do! That's what Panoply does on its shopping excursions, and I'll bet you do, too, don't you? Hurry back, I've got a few more things to show and tell! Next up: another piece of vintage luggage. This one's from a fellow (I'm assuming) who attended VPI (Virginia Polytechnic Institute), now known as Virginia Tech (since 1970). The side has the guy's initials, ELH. One of my Panoply sisters dubbed the fellow, "Edward Leonard Harthgood", to which we had a good, hardy, cross-your-legs kind of laugh! How cool are these? The notary embosser reads, "NOTARY PUBLIC SEAL INDIANA", and is marked Pat. 1804 on the side of the lion head. The paper cutter is much smaller than typical (about 6" square). I am drawn to these kinds of items from my own career as an accountant (and notary public), and they remind me of my dad, who was also an accountant (and notary public). Next is another pick which I have already placed in the Panoply booth. I was able to source both the round and square Fostoria American cake pedestals / salvers. These are highly sought after in our region, and I wonder if that's true in any of my readers' areas? I had tried for years to score the square style, in more than one auction, with no success. There are four sets of cups with saucers, and luncheon plates, all made by the Homer Laughlin Company of Newell, WV. This china was designed by Dorothy Draper for the Greenbrier just after WWII, in her signature brights. The colors are a bit off in the true tone as a result of the sunlight streaming into the room, but they are vivid green with the pink rhododendron, our WV state flower, in the center. Other companies made this china for the Greenbrier (Mayer, Shenango and Syracuse among them), but I wanted Homer Laughlin since it is West Virginia based. China nirvana! I just wish the dealer had more of it. I am collecting Greenbrier china and tableware, piece by piece, in the hopes of making complete service for at least four. Alrighty, then, have we shopped till we're ready to drop? Did you see anything you liked or would want to claim as your own? I've already been out and about again this weekend, with items too late to post until another time. What are your most recent scores? I love show and tell, so please spill and share your recent loot.